JEE Main 2019 Correction Process started at jeemain.nic.in, by 14th October 2018. NTA is scheduled to organize JEE Main I 2019 Paper 1 between 6th January 2018 and 20th January 2019; however Paper 2 will be held only on 8th January 2018 in two shifts. JEE Main 2019 Correction Process has begun on 8th October 2018 on the official website of Joint Entrance Exam and National Testing Agency - jeemain.nic.in and nta.ac.in, respectively. 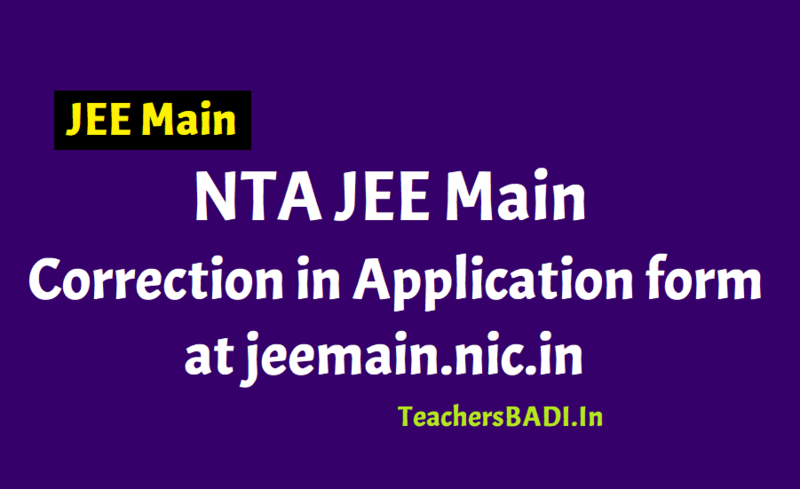 NTA had closed the JEE Main 2019 January application process on 30th September 2018 and candidates who had successfully registered for the same can now make corrections to their submitted online application forms. Candidates must login to the below mentioned url and cross check the details submitted by them to correct mistakes (if any) on or before Sunday, 14th October 2018, 11:50PM. ‘In order to ensure that the data of the candidates of JEE (Main)–January 2019 is error-free and candidates do not face any hardships later on, NTA is providing a One-time correction facility to the candidates in their Online Application Form except change of city of examination’ According to the official statement. In case any candidate changes his Category which requires him to pay more application fee, then s/he can pay the additional fee via Credit/Debit card /Net banking & UPI only. NTA is scheduled to organize JEE Main I 2019 Paper 1 between 6th January 2018 and 20th January 2019; however Paper 2 will be held only on 8th January 2018 in two shifts. JEE Main 2019 Application correction begins at jeemain.nic.in: The registered candidates who wish to make necessary changes can do so through the official website, jeemain.nic.in, till October 14. 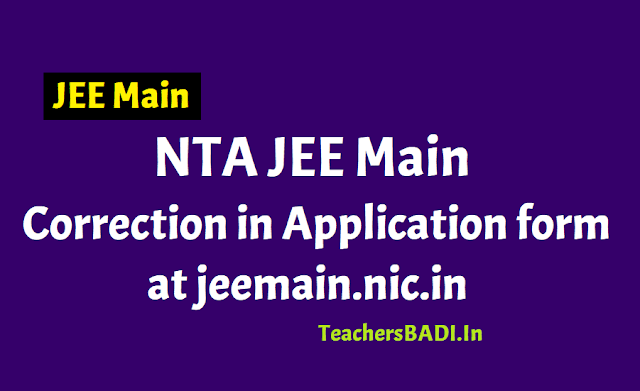 The online window to make necessary changes in the JEE Main application form has been activated, the registered candidates can make necessary changes through the official website, jeemain.nic.in, by using their application number and password. The registered candidates who wish to make necessary changes can do so till October 14. Earlier, the National Testing Agency (NTA) has released the exam dates and shift for JEE Mains 2019. As per the official notification, the paper 2 of JEE Main will be held on January 8, 2019. The first phase examination will be conducted from January 6 to 20, 2019 and the admit card is available to download from December 17, 2018.